Executive head teacher Elizabeth Baines (left) receives the award from AcSEED principal assessor Helen Galsworthy. 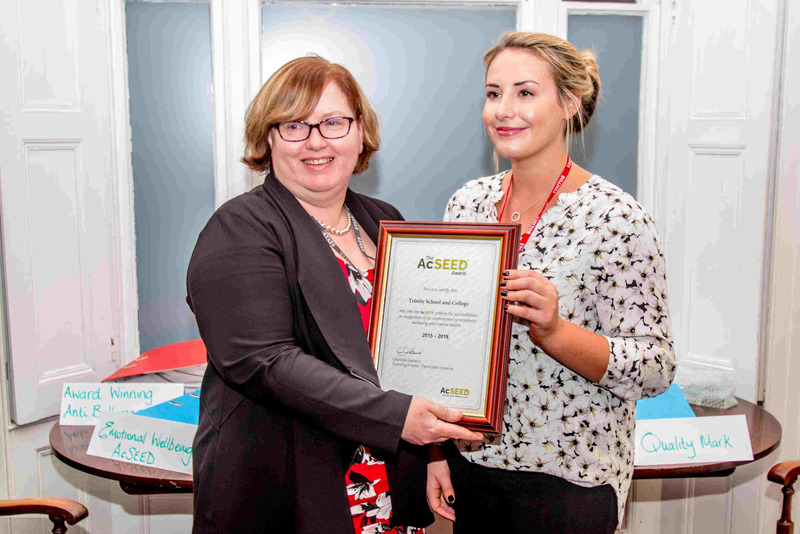 Trinity School and College were presented with The AcSEED Award at a ceremony held to mark the occasion on Friday 27th November 2015. Trinity is the first school in the South East, and the first independent school, to receive AcSEED accreditation. The presentation ceremony was preceded by a tour of the school. Nick Gatherer, CEO of The AcSEED Initiative, said "It's great to see that Trinity School and College have fully embraced a whole school approach to wellbeing which is a fundamental principle of the AcSEED assessment framework. The directors and staff have an excellent understanding of their student's needs, and have tailored their emotional wellbeing and mental health provisions accordingly". Opening the presentation ceremony the Mayor of Medway, Cllr Barry Kemp, noted that this prestigious award was appropriate and justified recognition for the vision and dedication of the directors and staff at Trinity. AcSEED Founder Charlotte Gatherer said "The focus on wellbeing support is deeply embedded into the ethos and the environment at Trinity, and is very well aligned with the founding motivations of AcSEED. I'm sure any young person would find this a safe and motivating setting for both academic and emotional development". 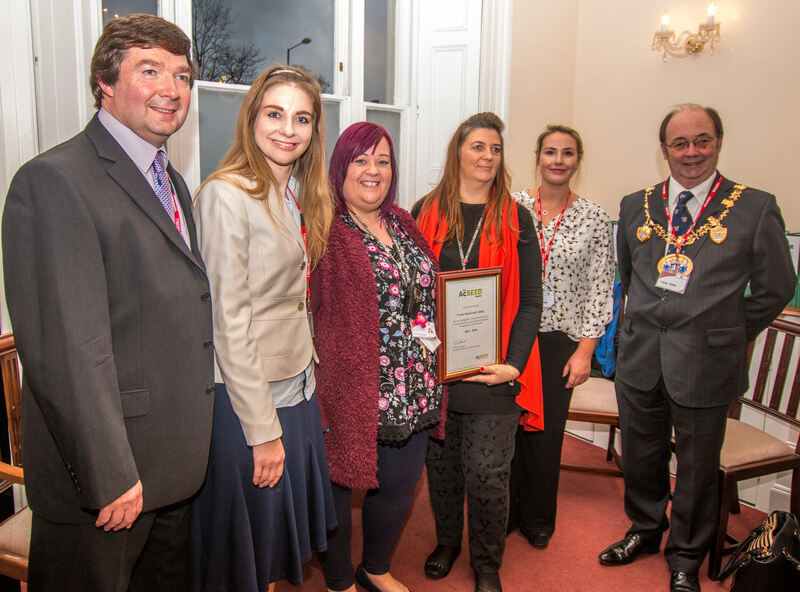 L to R: AcSEED CEO Nick Gatherer, AcSEED founder Charlotte Gatherer, Trinity wellbeing staff Linda Hurren and Georgina Moorcroft, AcSEED principal assessor Helen Galsworthy, and Mayor of Medway Cllr Barry Kemp. In presenting The AcSEED Award to Trinity School and College, AcSEED Principal Assessor Helen Galsworthy said "Trinity wellbeing support satisfied not only the mandatory AcSEED criteria, but also many of the advanced best practices. The assessment team were impressed by many of the wellbeing provisions including the use of a dedicated policy for Mental Health and Emotional Wellbeing, use of ASDAN and other programmes targeting practical exploration and vocalisation of emotions and effective communication, and providing the opportunity for parents to join staff training on emotional wellbeing". In receiving the award on behalf of Trinity School and College, Executive head teacher Elizabeth Baines paid tribute to the knowledge, skills, and dedication of her staff. 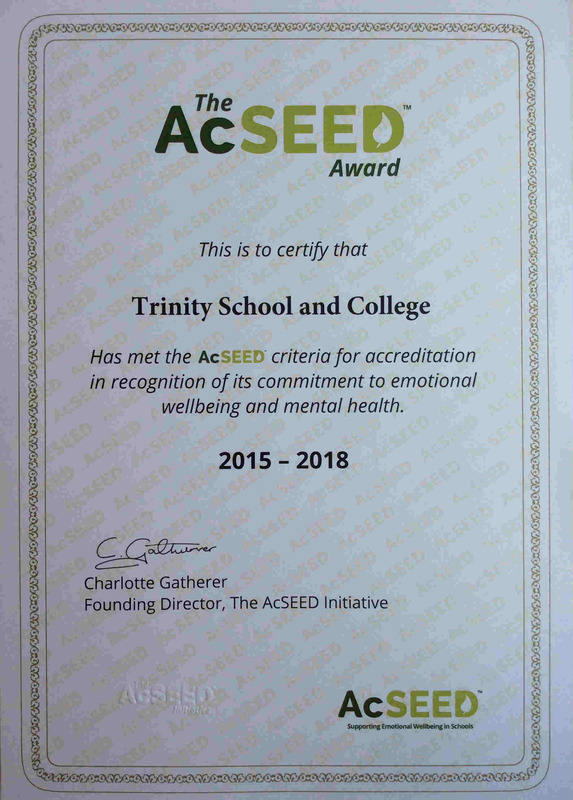 She also noted that whilst the school was well recognised for their specialist expertise on learning difficulties, she was particularly pleased to be accredited with The AcSEED Award as emotional wellbeing and mental health support was the one common thread through the needs of all students at Trinity.